I’ve had short hair for over a year now, how is it that I just now found a way to style it? Honestly, I bought three different curling wands and spent hours trying to get those “effortless soft waves”, burned myself numerous times in the process and nothing. As it turns out, it’s the flat-iron that does the trick. An old, forgotten about flat-iron I’ve had since I was a Sophomore in college. Sometimes it’s the oldest tools that work best. 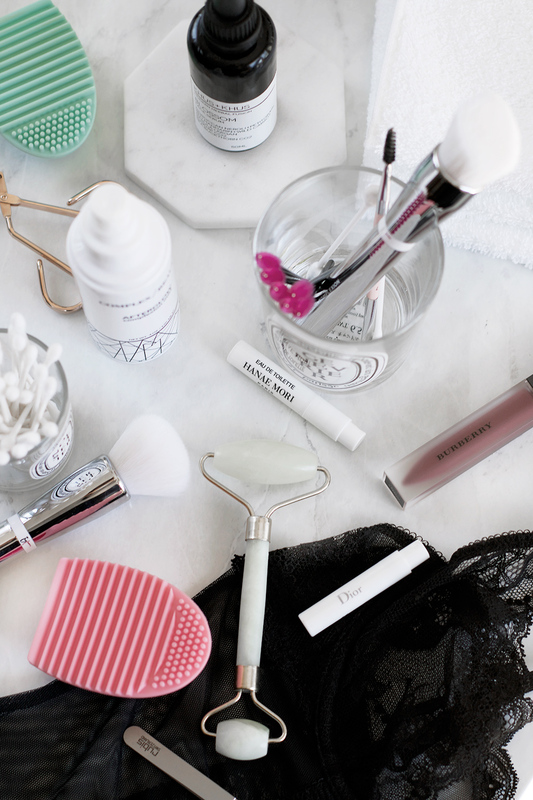 If I were to sit here and list every single beauty tool that I use and love, it’d take me all day. 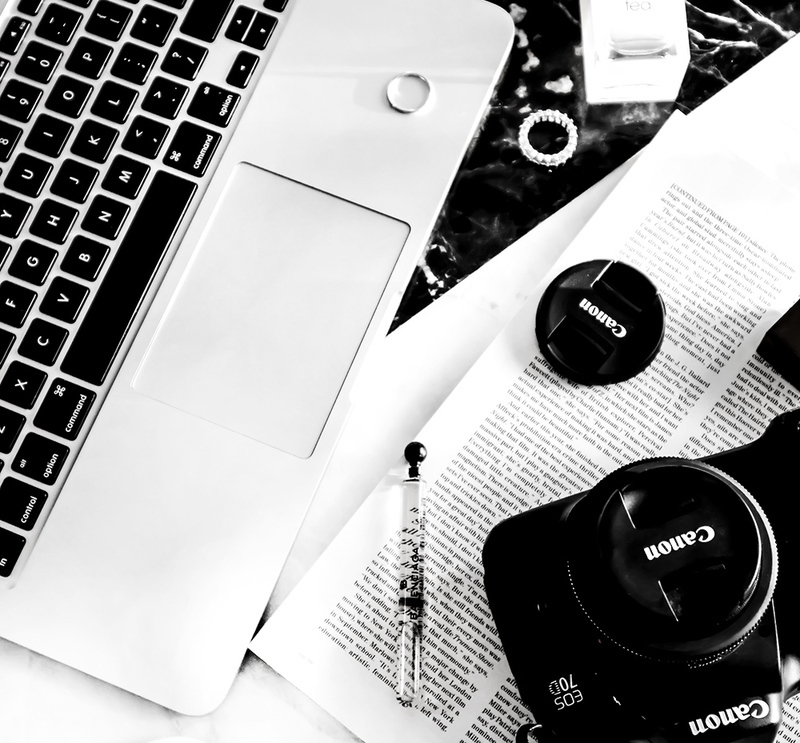 So, instead, I thought I’d talk about a few that I use daily, but don’t often mention here on the blog. I’ve been using oils on my lashes and brows for a while now, so I go through a lot of disposable mascara wands and always keep a bunch of them around. If you do any DIY lash/brow treatments, always go with disposable wands- especially if you have sensitive eyes, like me, and don’t want to end up with a painful stye. These wands also come in handy sometimes when I do my makeup- ever apply too much mascara, anyone? Speaking of brows, now that I’m going for a more natural look, I also no longer thread them. Well, okay. The truth is, the only person that I trusted with my brows moved out of state and after trying a few new places, I gave up. As it turns out, making two brows look even is an art many have yet to master- well, at least when it comes to my brows, anyway. I didn’t think that I’d trust myself with tweezers again, after years of over plucking (which my left brow is still recovering from) but I love these Rubis ones. They were actually sent to me a while ago and I didn’t think I’d be this impressed with tweezers. Love how precise they are; finally, I don’t have to sit in front of the mirror for an hour, to get that one stubborn hair on my chin that pops up every few months (PLEASE tell me I’m not the only girl to get these?!). Another little tool that I can’t go without is this little facial hair/eyebrow razor. I wrote an entire post about dry-brushing and it’s still one of my favorite beauty + wellness rituals. 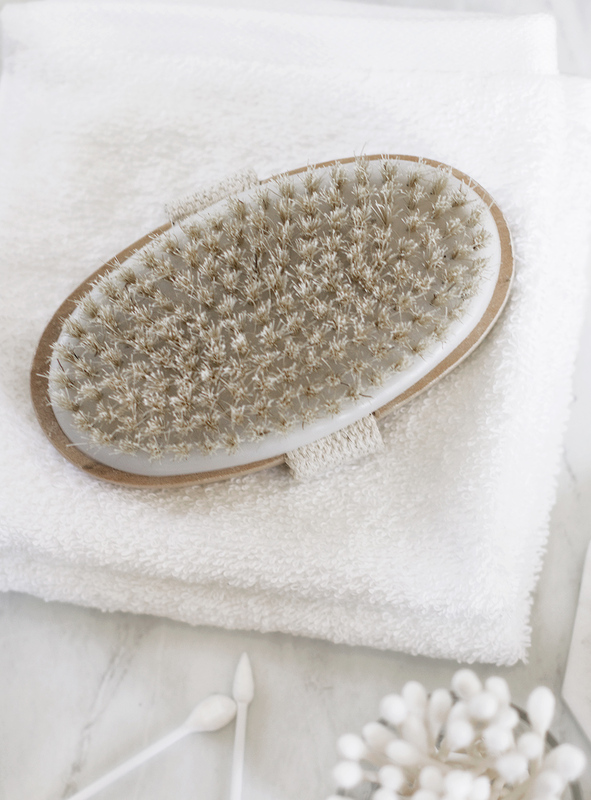 Other than exfoliating, it also gives a nice energy boost in the morning and I love that it helps me keep my skin smooth and my legs ingrown hair free- I definitely recommend going with natural bristles. Another exfoliating tool that I also wrote a separate post about in the past, is the Salux cloth. I’ve been using this cloth in-shower for more than a decade now and can’t imagine using anything else- especially a sponge/loofah. These are a lot more sanitary than any loofahs or sponges. They dry very quickly, do not harbor bacteria and are very long-lasting and easy to care for. They also turn any body wash or soap into an exfoliating product and they’re long enough to easily stretch across your back. Also love: these cute Makeup Brush Eggs. They’re very handy to use for spot-cleaning your brushes and for surface cleaning. They’re made of very soft silicone and I like using them to clean my eye makeup brushes. I find that with foundation brushes- especially very dense ones- I still prefer using my hands when cleaning them. I have A LOT of makeup brushes, but only use a handful on a day-to-day basis, so I think that these are perfect for someone who doesn’t have a huge collection of brushes. Another tool I now can’t live without: a jade roller. Jade rollers have been around since 7th century; jade is associated with protecting against negative energy and balancing your qi. Using a jade roller increases blood circulation and promotes lymphatic drainage- it’s also said to make your skin radiant. I’ve been using mine for a few months and I love it. I swear that it makes my skin look more plump and healthy and using it is now my favorite morning beauty ritual. The jade is naturally cool, so it feels very refreshing on skin (after a few minutes of use, it does warm up). I’ve heard of people putting their rollers in the fridge or freezer, but just like with an ice-bath (which is my favorite thing to do when my skin looks dull) avoid doing this if you have thin and sensitive skin. It’s very easy to use- you just roll it in an upward fashion, starting from your neck, all the way to your forehead. I don’t know that it’s something that will give you dramatic results when you already have radiant skin, but I’ve been loving it and not only for the fact that it makes my skin look plumper. It also helps with morning puffiness and dullness. I’m on month 5 of accutane and still wake up with headaches 80% of the time, and I find a little cooling facial massage to be very soothing in the morning (I’m seriously at a point now when I can’t wait for my treatment to be over). 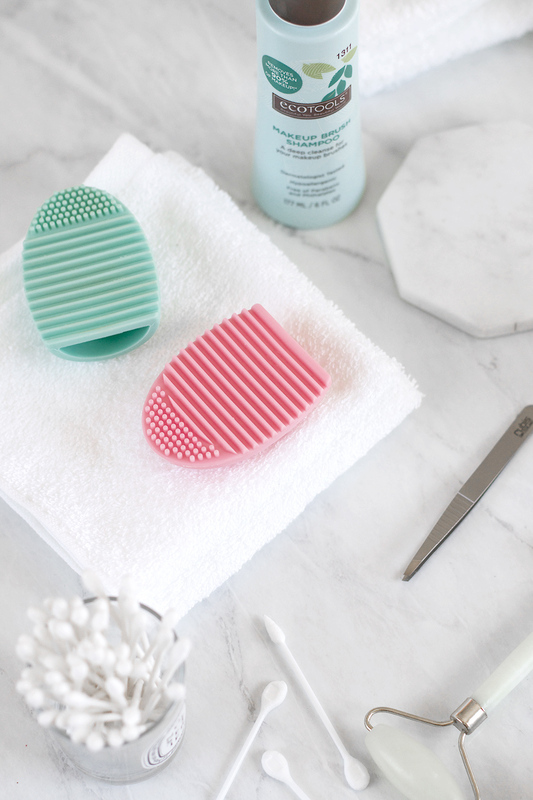 It’s been years since I’ve used my Clarisonic- I keep it simple these days with cotton washcloths. I use basic ones like these, and microfiber ones like these when I want something super soft. Love them because they last forever- I just wash them in hot water with a dye and fragrance-free detergent. Also, super basic but comes in handy every single morning when I do my makeup: these little Eye Tees and tissues. What are some of your favorite beauty tools that you reach for every day? Anything that I should try?